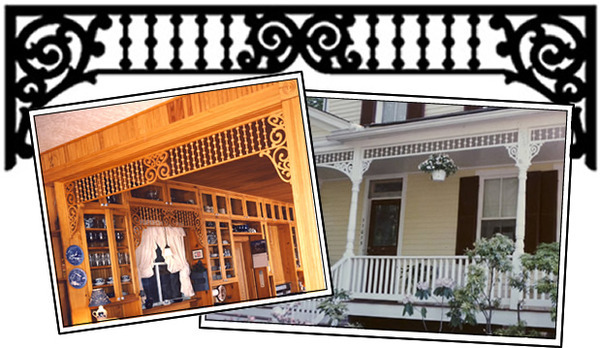 When Victorians discovered Spandrels, the porches of Victorian America were forever changed! Streets and avenues in every town and village soon displayed a charm and gaiety both pleasant to the eye and uplifting to the spirit. Equally exhilarating were the many marvelous ways Spandrels began to serve as interior details of great and lasting merit! Entry halls, kitchens, and parlors soon blossomed into unique and noteworthy rooms. We offer a generous selection of Spandrels for both interior and exterior use. And, we'll handcraft each of your Spandrels to the exact length required. You need only supply accurate measurements (steel measuring tape, please), and we'll take care of the rest; promptly shipping Spandrels that convey your romantic outlook. So, discover Spandrels yourself, and claim the glory of the past for your own home. 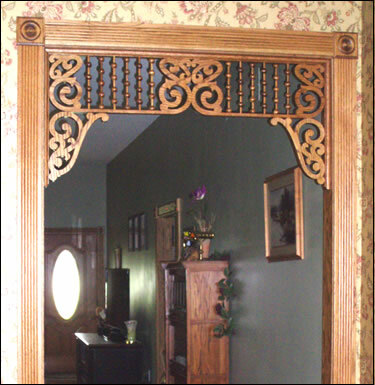 Fretwork Spandrels combine fancy scrollwork with Ball & Dowel or Spindle sections. Fan Spandrels substitute quarter and half fans in place of the scrollwork. Classic Spandrels have neither fans nor scrollwork, but their continuous rows of Balls & Dowels or Spindles can be quite mesmerizing. Cut Out Spandrels feature only cutwork but arranged in continuous rows like our Classics. Fretwork and Fan Spandrels are perfect for interior use, where their elegant detailing may be enjoyed at close range. They are also very elegant used outside. Classic and Cut Out Spandrels are right at home on your porch, where a lower cost per foot and wide range of sizes are often important considerations. Choose heavier designs for large porches and lighter ones for smaller outside use and for interior installations. We're on your side... If we know a way to save money, we don't hesitate sharing it, even if it means lower sales for us! The Applique Spandrel Technique... Cut plain boards to length for installation between Porch Posts (where Spandrels would typically be used). For extra depth, add 3/4" thick narrow boards to the face of each at all four edges (front and back, or only on the front). Paint these smaller boards a contrasting color (the white border seen in the photos). This border not only adds depth, but makes installation of the main boards easier. Then, pre-paint our inexpensive Appliques in the same contrasting color and screw these equally along each board, leaving half the spacing distance at the ends of each board. If spaced fairly close, the overall effect is very good.